The adventure of L'Eroica all year long with the permanent route. The great adventure of L’Eroica is no longer reserved to the first Sunday of October. The best vintage race in the world can be enjoyed with your bike all year long with the permanent route. The route starts in Gaiole in Chianti and covers 209 km of charming location and atmospheres, through hamlets and vineyards, woods and olive groves, squares and meadows which poets and artists have sought to capture in their works and which cyclist can discover as he pedals along in endless joy. The route is open to all and since it is not an organized event, but the freedom to ride on roads open to traffic, it is mandatory to comply with the “highway”. There is no registration, mechanical assistance or recovery by the van. For the type of route it is recommended, for safety reasons, the use of a helmet. L’Eroica and Anima Toscana does not assume any responsibility for any injury or damage to persons or property that may occur at any time on the trip. The Eroica route starts in Gaiole in Chianti, winding among historical vineyards that lead you to Castello di Brolio with its cypress access road. The breath-taking panorama below the walls, over the vineyards, represent one of the most wonderful parts of the permanent route. After few kilometers, near San Giovanni a Cerreto, Siena will be outlined on the horizon. The visit of this wonderful medieval city with the Dome, Piazza del Campo and the perfect medieval city center will make special your trip. Technical characteristics: easy segment of 20 km, the only climb is to join the Castle of Brolio. After 10 km you will have the first experience on the white roads, we suggest to be careful and boost your confidence on this kind of road. The ordinates cultivation of vines is fading into a more various landscape, painted with terra di Siena color. Just leaving the city of Siena you’ll ride through a very typical segment of the route, located between “Colle Malamerenda” and Radi, deep in the gentle hills of Siena, studded of farm houses, medieval villages, merging your ride with the Via Francigena itinerary. The village of Murlo will be the landscape of the easiest segment of the whole permanent route. Technical characteristics: long segment of 47 km, the area around Siena is an easy mix of white and paved roads. After Siena you will ride for 2 km on the busy Cassia road before reaching a long segment of white roads, approximately 12 km, composed of short steep climbs after the small town of Radi. We suggest to refill your bottle in Vescovado before ride your bike to Montalcino. Climbing Castiglion del Bosco, one of the most engaging segments of L’Eroica permanent route, you will reach Montalcino over the beautiful and panoramic lands of the Brunello of Montalcino. Montalcino, also famous for olive oil and honey, it’s a nice village that merits a visit, even to admire the incredible panorama opening on the Val d’Orcia area. Technical characteristics: the segment from Bibbiano to Montalcino it’s one of the most difficult of the permanent route. Passing the golf course of Castiglion del Bosco you will ride a long and irregular climb, with slopes more than 15% surrounded by woods. The descent from Montalcino will be a delicious dive in the vineyards, bringing you through smooth, pristine hills until Lucignano d’Asso, where you can take a rest with a typical snack or just to refill your bottle. Pedaling in the landscape of the Val d’Orcia is a privilege for the eyes and mind that restores the fatigue caused by the up and downs roads. Technical characteristics: the Val d’Orcia area comprend 26 km of white roads, sometimes also challenging, on a total of 30 km expected in this segment. Be careful around Lucignano d’Asso where you can meet livestock guardian dogs stay with the group of animals they protect as a full-time member of the flock. From the vineyards and rolling hills to the beauty of the lunar landscape is a short step. Once you have left the villages along the Cassia, you will be immersed in the Crete Senesi with its characteristic gullies. Oak trees and cypresses indicate isolated farms where they produce cheese, and tables are enriched by the “diamond of the Crete Senesi”: the white truffle. This part of the route includes the difficult unpaved road of Monte Sante Marie, a very famous steep road that will take you back to the Chianti area. Technical characteristics: the road after Pieve a Salti will make it easier till you reach Caggiolo, where a difficult unpaved sector will begin, due to the bad road surface and slope. Once you have arrived at Asciano cemetery, we suggest a quick stop in Asciano town center to refill bottles before riding the long and very challenging road of Monte Sante Marie. From the vineyards and rolling hills to the suggestion of the lunar landscape is a short step. Left the villages along the Cassia immerse yourself in the Crete Senesi with the characteristic gullies and. The oak and cypress indicate isolated farms where they produce cheese and tables are enriched by the diamond of Crete Senesi: the white truffle. This part of the route includes the hard white road of Monte Sante Marie, very famous steep road that will take you back in the Chianti area. Technical characteristics: Castelnuovo Berardenga and the next part of road will allow you to relax after the effort on Monte Sante Marie. 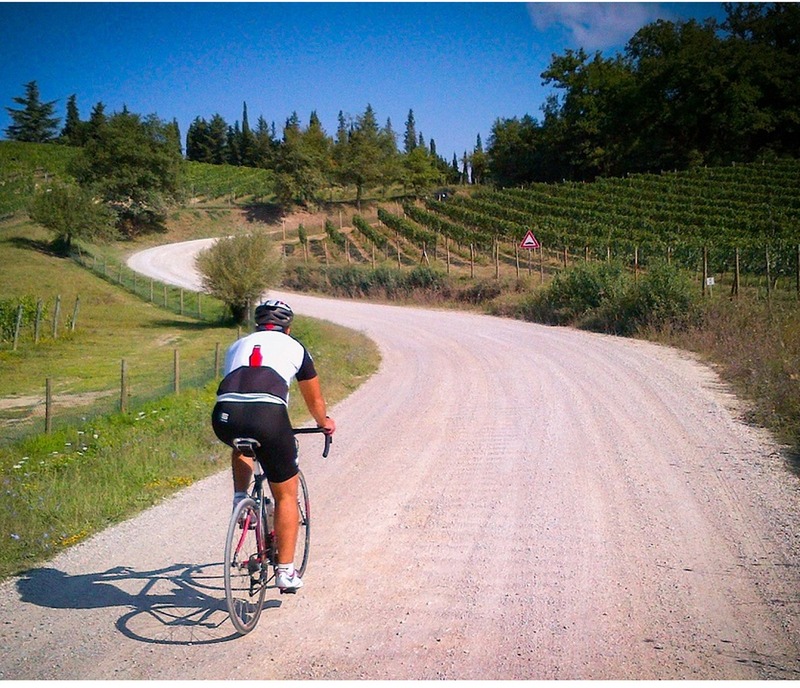 After Pianella it’s the moment to climb the long gravel road to Radda in Chianti, located at 500 meters on the sea level, before you descend to Gaiole in Chianti.